It's time to expand your definition of the word bacon. Chefs and butchers are creating new variations from the fatty parts of lamb, goat and even fish. Here, five new bacons to welcome into your mouth. 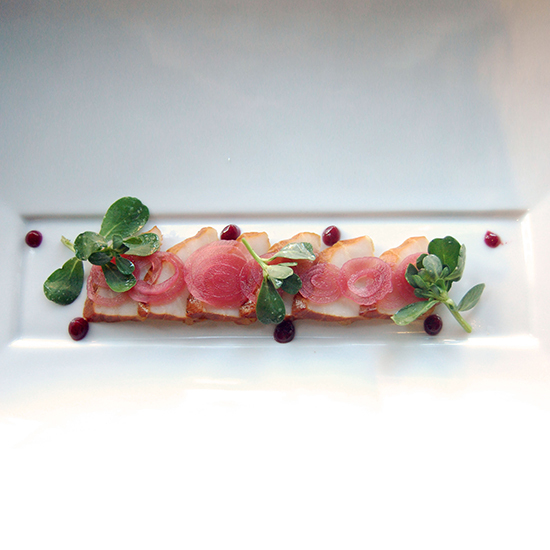 At Brabo, a Belgian-inspired restaurant in Alexandria, Virginia, chef Harper McClure created sturgeon bacon. It’s an easy fish to treat like pork, thanks to the rich, fatty striations in the flesh. McClure cures the fish with muscovado sugar, maple syrup, brown sugar, salt and spices for 48 hours, then slow smokes it over applewood. It’s served warm out of the oven with stewed and pureed Concord grapes, pickled pearl onions and purslane. At restaurateur Drew Nieporent’s latest New York City ode to fine dining, Bâtard, chef and partner Markus Glocker includes lamb bacon in the lamb for two. The dish consists of a roast rack of lamb, braised lamb shoulder and the crispy bacon, which Glocker sources from Smoking Goose, a butcher shop and artisanal charcuterie producer in Indianapolis. Glocker describes the lamb bacon as having the grassy gaminess of lamb but with the sweetness and smoke of traditional bacon. Goat belly isn’t a widely used cut so at Paul Virant’s Vie in Western Springs, Illinois, chef Dan Compton uses it to make bacon. He cures it for several days with a mix of kosher salt, curing salt, sorghum and black pepper; then he smokes it. “It is fairly similar to regular bacon,” Compton says. “But with some distinct goat funk to it.” Instead of slicing it, he dices it, renders it and uses it to flavor both braised goat leg and roasted cabbage. The extremely indulgent foie gras burger at SoBou in New Orleans is a showcase for duck. It’s topped with a sunny-side up duck egg, pan-seared duck liver, foie gras fondue and duck bacon. To make the bacon, chef Juan Carlos Gonzalez rubs duck breast with brown sugar, salt, red pepper flakes, whole black pepper, fennel seeds and coriander seeds, then presses it and refrigerates it for 72 hours. Then, it’s sliced thin and baked until crispy. “It almost tastes like jerky,” Gonzalez says.